Kent Paranormal will be attending an event run by Spooktacular Events at Charlton House in London on January 21th 2017. In 1680 Sir William Langhorne purchased the estate of Charlton House, located in South East London, in the Borough of Greenwich. He was anxious to have an heir to whom he could leave all the wealth he had accumulated. His first wife was Grace, the Dowager Viscountess Chaworth. She lived less than a year after the marriage, and her death, in 1700, added even more to Sir William’s wealth, but he was still without a child. In 1714, he was 85 years old and still desperate for an heir. He married a seventeen-year-old girl, Mary Aston. Unfortunately, he died two months after the wedding, leaving no direct heir to his fortune. The Baronetcy became extinct at his death and his fortune went to a nephew, Sir John Conyers. Sir William’s body is buried on the grounds of Charlton Parish Church, but some say his spirit still wanders through the rooms and hallways of the mansion where he lived the latter years of his life. Stranger still, he is still looking for a young lady to give him an heir. Girls staying on the premises overnight have heard the doorknobs of their bedrooms turning, but no one enters. Other young ladies have had their backsides pinched by invisible fingers. Does Sir William still haunt the mansion looking for a fertile bride? 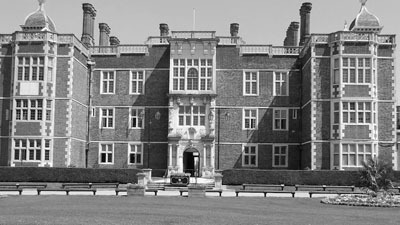 Over the years, other ghostly occurrences have been reported at Charlton House. Staff members’ belongings mysteriously disappeared, only to reappear later in a different place. The elevator was heard creaking as it went up or down of its own volition. A grey lady has been seen walking towards the walled garden carrying a bundle which resembled a baby. During restoration work, the mummified body of a baby was actually found in a fireplace of the old mansion. It is believed to be the child of a servant, who was either stillborn or dispatched in panic by its terrified parent.